Now that I've finished up my holiday sewing, I sat down this morning to work on these cute mini bow-tie blocks for Sharon over at Motherdragon's Musings as part of our Compass Quilter's bee. After all the hustle and bustle of Christmas, it was the perfect project to ease me back into the sewing routine. I'll be honest, I tend to shy away from snowball corner blocks (I think that's what they're called) because they always end up being too small after I add that tiny little square in the corner. But this block forced me to take my time and really focus on my accuracy and a scant seam to make sure everything measured up correctly. Now to get them in the mail to sunny Australia! I hope everyone had a wonderful holiday. I know we did. Probably the best we've had in many years. Very low-key but with so many great memories, many because our 4 year old finally understood the whole Santa and presents concepts. It made things very fun for all of us. We try to focus on experiences and making memories rather than a lot of gift giving. 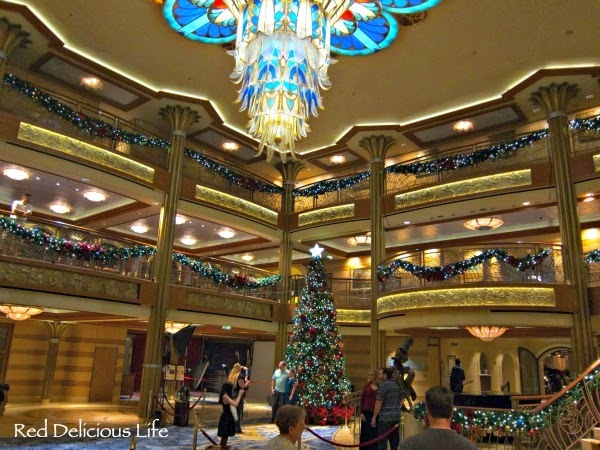 Most times those experiences happen throughout the year, not necessarily during the holiday season, but this year we wanted to experience the special magic that Disney offers on their holiday cruises. 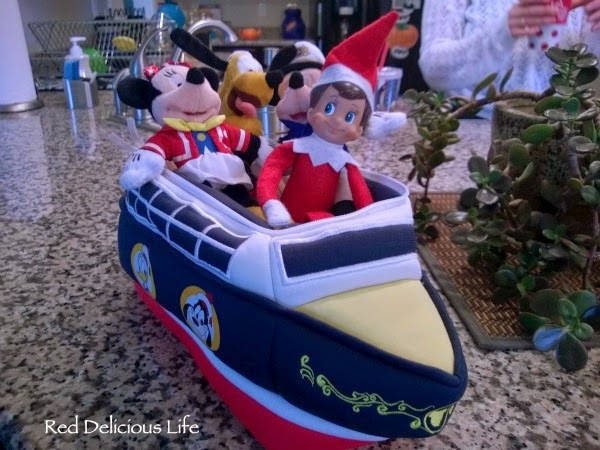 Sprinkles, our elf on the shelf, even got into the spirit. I didn't do as much holiday sewing this year and I'm okay with that. 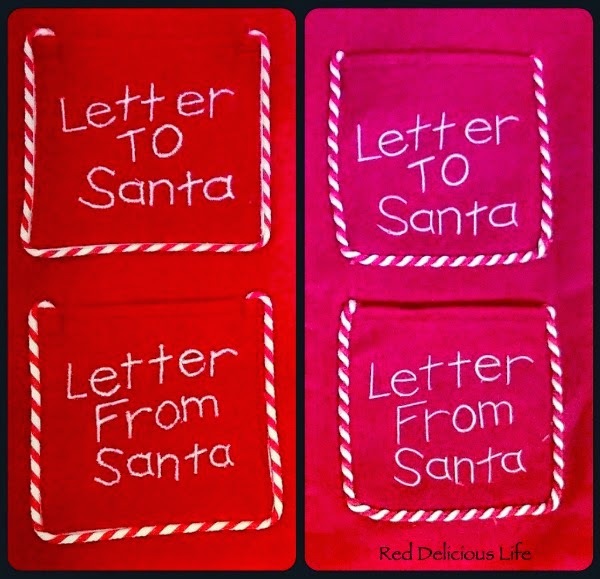 I gave a glimpse of the commissioned Christmas stocking that I was working on and here is the finished project. Mine is the one on the left. I also made some potholders for my parents and mother-in-law. 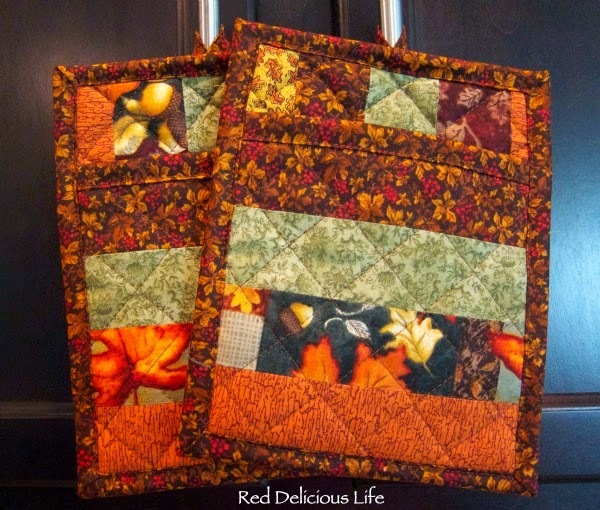 They're a really quick project and works well with scraps. I used this tutorial, if you're interested. I made the set for my mother-in-law on Christmas morning so I didn't have a chance to photograph them but here are the ones I made for my parents. They've also requested some holiday and spring themed ones that I'll have done for them when they come for a visit in February. We'll be hosting a laid-back New Year's eve get-together with some of the families in our neighborhood so that's the next big thing on my calendar but I'm hoping to get a bit more sewing done before then. 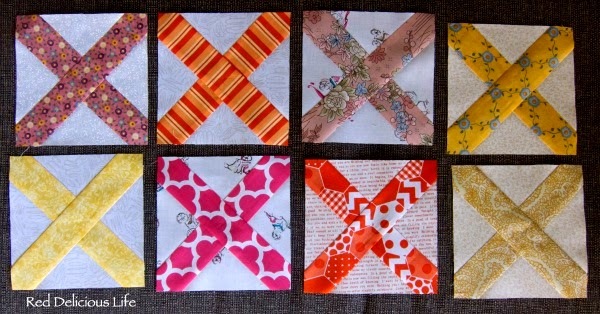 I still need to finish up my November blocks for the Compass Quilter's Bee and get them in the mail to Sharon! 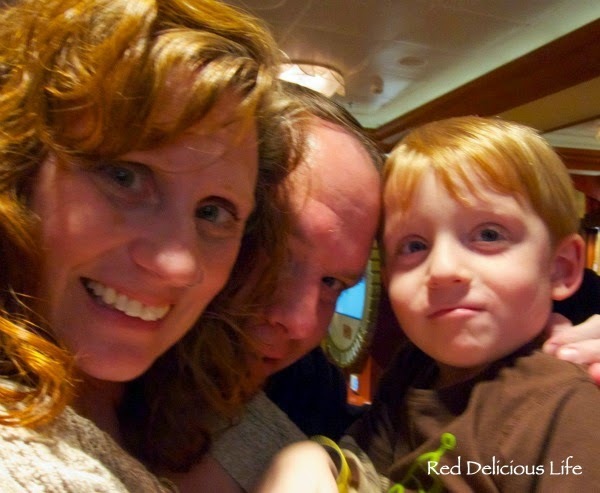 I leave you with a family selfie that we took on the Disney Dream. It's a little bit out of focus but it reflects the happiness of our holidays. I'm wishing all of you that same happiness now and into the new year. Over the last few weeks I've scored some good online deals and as a result have increased my stash. I know of others that have gone on fabric diets but I like to think that I'm cautious enough that I won't ever have to resort to those measures. But I'm really excited about what I've picked up. 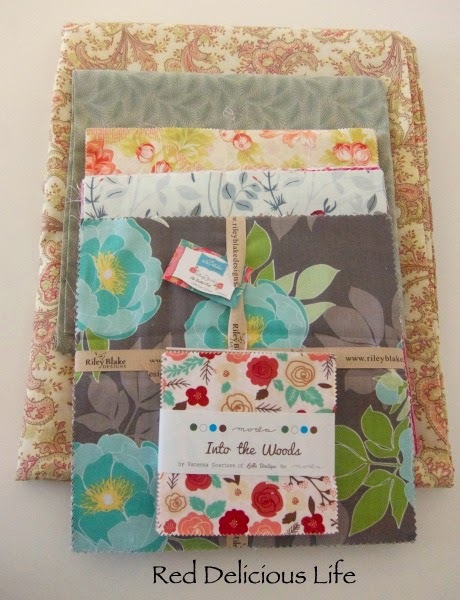 Couldn't pass up a charm pack of Into the Woods - I just love the mix of pinks, reds, and aquas. Next up are 3 layer cakes. 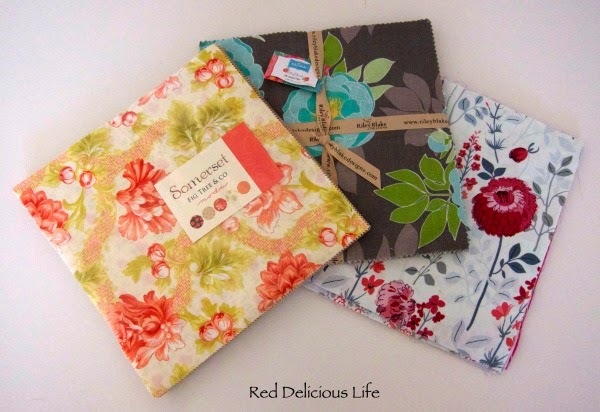 My favorite purchase of the lot is Somerset by Fig Tree & Company. I have so many ideas on what I want to do with this that it will be hard to choose a specific pattern. 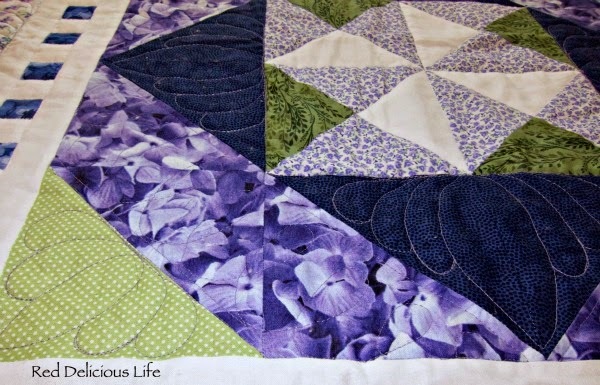 The layer cake in the middle is The Cottage Garden by the Quilted Fish. What drew me to that fabric line was the triangle prints and the text prints. The last layer cake was a true impulse buy. It's Flirt by Dear Stella. I don't have a lot of pinks in my stash but I really liked the combination of the pinks and reds with the varying shades of gray. There are also polka dots and I'm a pushover for those! The other 2 fabrics are for my pinwheel quilt. The green fabric is for a 5 inch border all the way around. It's the Lady Edith small branches fabric from the Downton Abbey line. The floral paisley is Rosemont Malabar Ivory and is a wide back fabric for the back of the quilt. 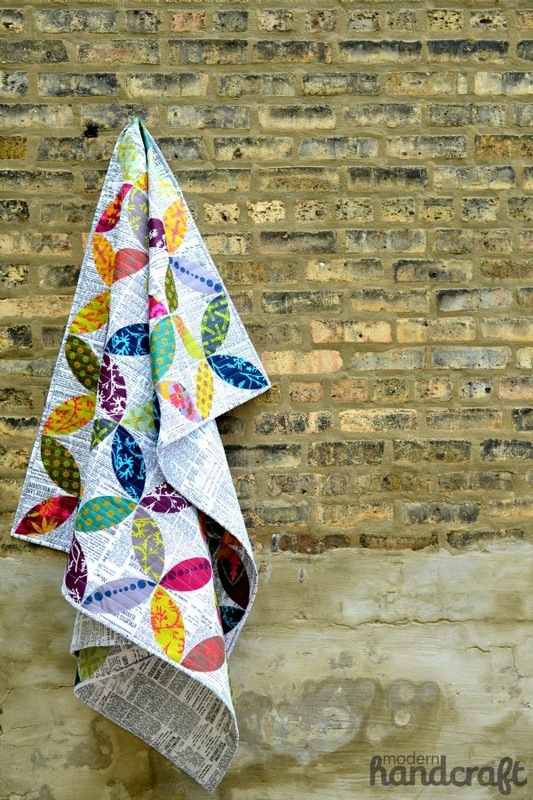 I was on the fence about this particular fabric but I know that the recipient for this quilt will love it. Now I just need to finish up my holiday sewing so I can get to using these. Nothing like the lure of new fabrics to motivate me! Wow, it's been almost a month since I've posted. How did that happen? Well, I know exactly how it happened. It's called the holiday season and it's in full swing in our house. The few weeks leading up to the Thanksgiving break were filled with crafting, holiday sewing, volunteering, and easing my way into the workforce. In the next week or so, I'll be posting some of the other projects that I've been working on but first I wanted to share with you the challenge that I've undertaken. 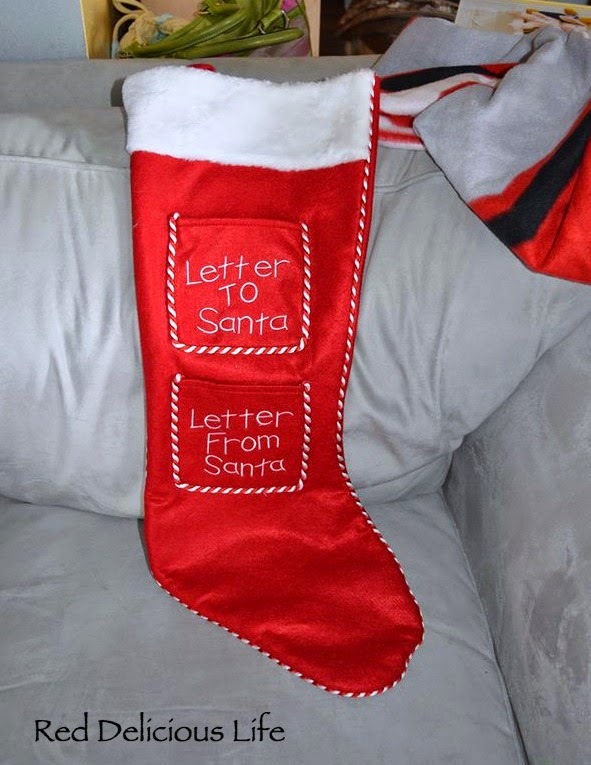 A friend of my husband reached out to me a few weeks ago wondering if I could make a Christmas stocking. She had a special one for her daughter but couldn't seem to find one that matched for her younger son. Here's the picture that she sent me. Basically 2 pockets and a large stocking. Should be easy, right? Famous last words. In theory it should have been pretty easy but let's be honest - it's me. But I was still up for the challenge. My first hurdle - finding piping to match. You'd think that with it being the holidays that red and white satin twisted cording should be available somewhere. Ahh, sadly no but after 3 days of searching I was able find a suitable substitute online. I've never worked with cording before and for this particular one I learned (the hard way) that when you cut it, it starts to unravel! Oops. Next hurdle was the lettering. 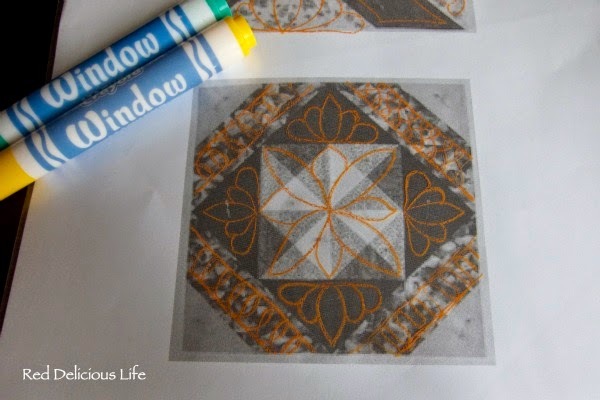 It's funny really, that when I was shopping for a sewing machine when I decided to start quilting, I was convinced that I didn't want an embroidery machine because I'd never use it. Let's see, this is now the 4th project that I've done with intricate lettering. Still not sure I could justify the added cost, but it sure would make lettering a LOT easier. The letters seemed simple in the original photo. 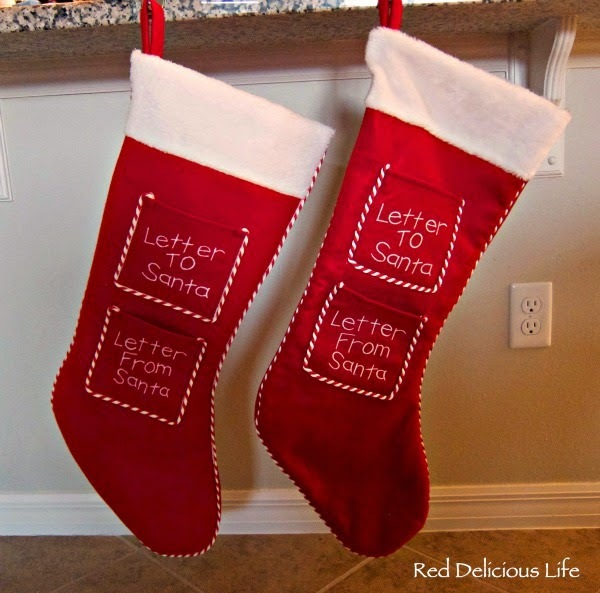 It wasn't until I received the original stocking that I saw they were done in a teeny-tiny satin stitch. It took a lot of time - almost 4 hours if you include my first failed attempt that needed to be ripped out. Here is a side-by-side comparison of the pockets. My pockets are the ones on the left. All I have left to do now is put the stocking together once more cording arrives which will hopefully be by this weekend so I can get it finished and shipped to the recipient. I think the hardest thing now will be to figure out what to charge. It's always hard putting a price on your time. Had some weird shadows and light in this location. I chose this name not only because of all of the purples, but it also represents my mom and me. She loved lilacs (and passed that love on to me) and I love fresh lavender. It makes me sad that Florida heat and humidity prevent me from planting either in our yard. The colors in this photo are pretty accurate. 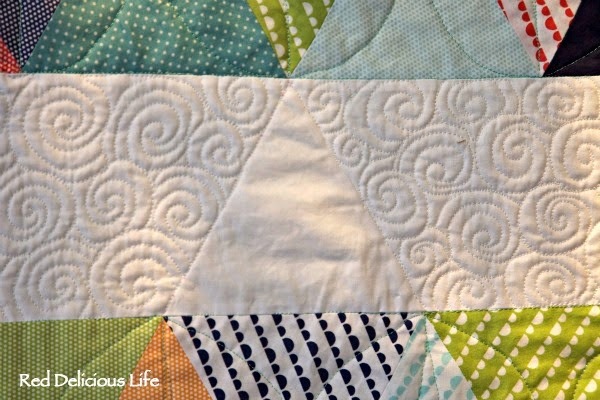 As I quilted this, I made the decision to NOT quilt in any of the white areas, except for a few echo outlines of the white squares. 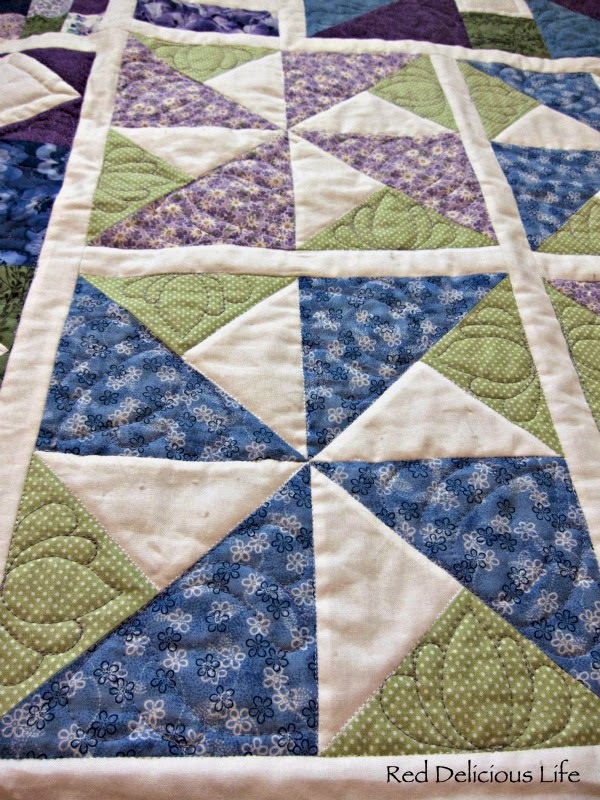 I stitched in the ditch around all of the white sashing and white triangles. I know this might sound odd, but I wanted the white to pop off the quilt. Most people want the individual blocks to pop, but me, I have to go against the grain. 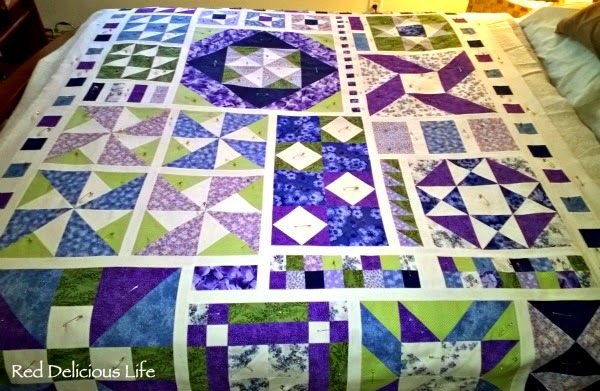 I was really paranoid about washing this quilt given some of the dark blues and deep purples. 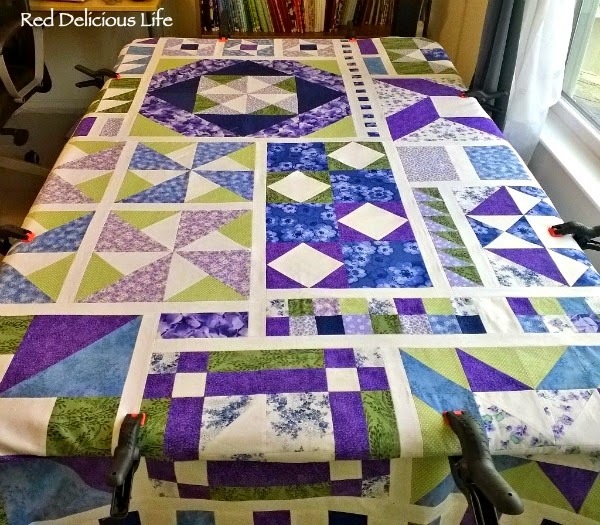 After I completed quilting it, I realized that my white extension table was tinted purple from the backing fabric so I was positive that it was going to bleed all over the nice white sashing when I washed it so I used 7 color catchers. Turns out I was paranoid for no reason. All 7 color catchers came out of the washer without any color on them. Go figure. Better safe than sorry. Looking forward to cuddling up with this on the couch. 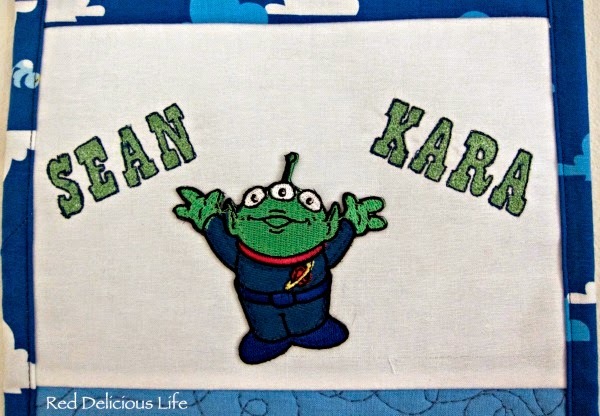 It's not easy being green but my son sure did his best. This was my easiest costume so far and one of the cutest. All it took was a trip to the consignment shop to find a green pair of pants, a green sweatshirt (the fact that Kermit was on the front was purely coincidental), a foam ball for the eyes, and some green mesh. He had a blast trick-or-treating and we had perfect weather, in the low 70's. My son thought this electric pumpkin was very cool. Now that Halloween is done, it's time to get into full-blown holiday mode around here. I just love autumn! Looking for a fun online bee to join for next year? 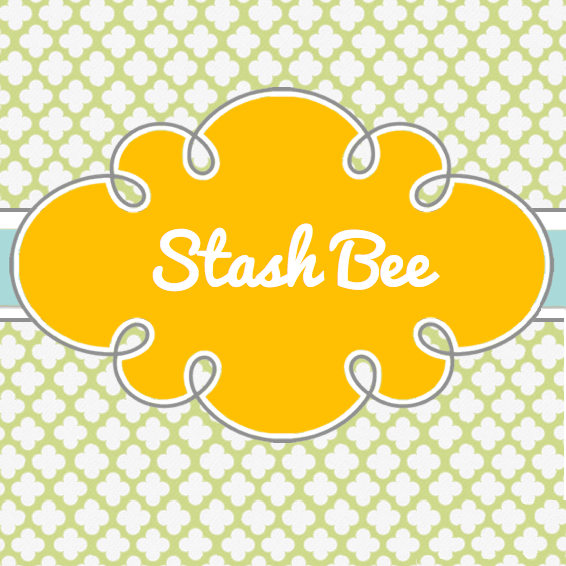 Why not join the 2015 Stash Bee! Stash Bee consists of multiple hives, each containing 11 hive members and running for 11 months (January-November). All hive members create blocks from their own fabric stash and are not required to buy specific fabric to complete the block. This is a bee that is open to all levels of quilters and is international friendly with each hive having a few non-US members. You can find out more info at the Stash Bee website or click here to sign up. Sounds like a lot of fun and I hope you'll consider joining too. Who knows, we might end up in the same hive! "...of inspiration, is at the heart of all creation." That is the theme song to my son's favorite ride at Epcot, Journey into Imagination. It's a really dated ride and makes me want to jab sharp objects into my ears, but I tolerate it since it brings my son so much joy. And the song had the ring of truth for me this week when trying to find my sewing groove. 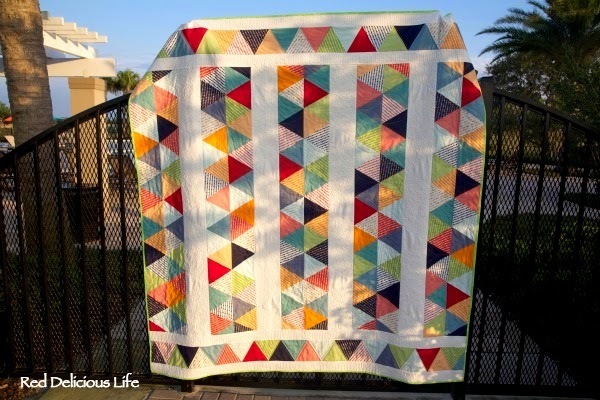 I don't need to have all the answers and know exactly what I'm going to quilt everywhere. I just needed a little something to get my creative process flowing. And it came in the unlikely form of mundane office supplies - sheet protectors and markers. But not just any markers though, they're my son's Crayola window markers. They dry fast and come off with the wipe of a damp paper towel (or even the scratch of a finger nail). I took pictures of the individual blocks, enlarged them onto a word document and now I have an easy way to test out different designs. I still don't have it all figured out but that's okay. It was enough to get me back at the sewing machine. I don't know where it went but I've officially misplaced my sewing mojo. Either that or someone stole it when I wasn't looking. I have various projects that I need to finish up and new ones that need to be started but I'm just in a sewing rut. When school started up again, I couldn't get into my sewing room fast enough. Maybe I went at it too hard. I don't know. It's not that I don't want to sew but I keep hitting little roadblocks, and then a lack of motivation sets in. I'm not sure how to quilt my A4A top, I've run out of my sashing fabric for my pinwheel quilt, and I don't want to start another large project until I finish at least one of these first. Also, Halloween is fast approaching and that means I need to work on a costume for my son. 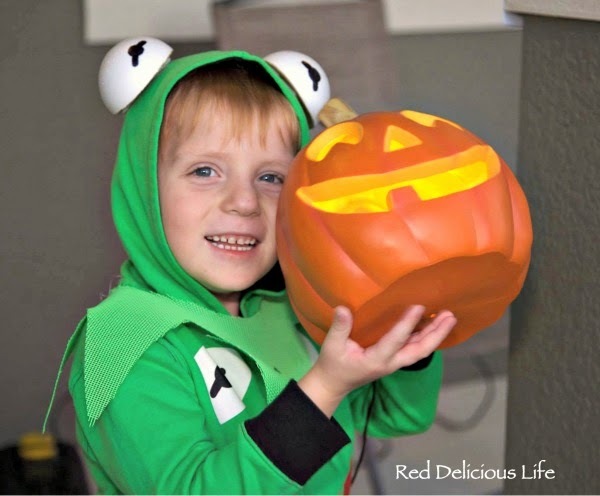 Given some of his sensory issues, he won't wear a costume if it feels too much like a costume. Plus, I much prefer the idea of making a costume than just buying one off the rack of a discount store. 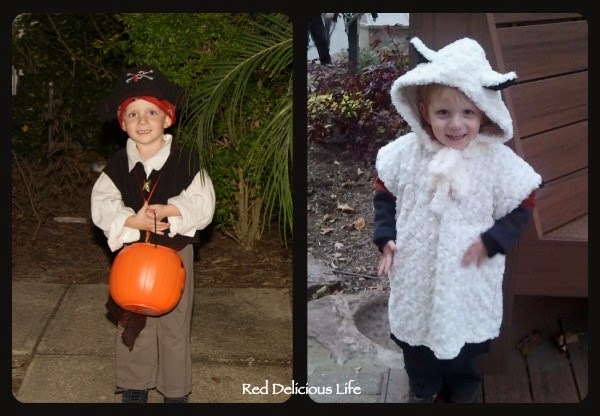 Last year he went as a pirate and the year before that he was a sheep. That sheep costume is still my favorite (you should have seen that adorable tail in the back!). 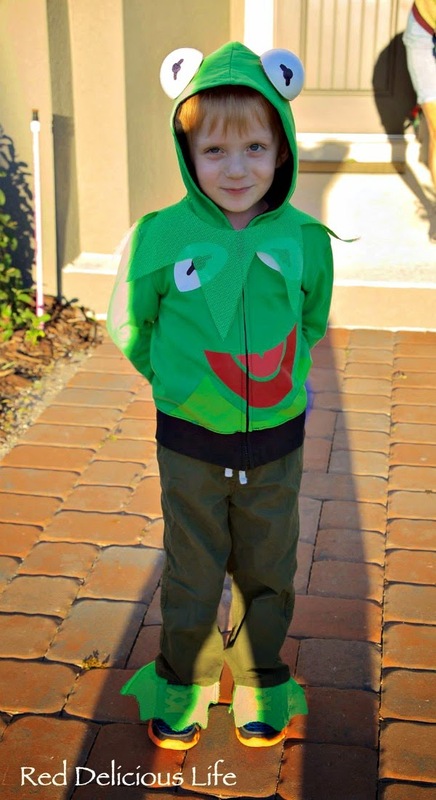 This year he wants to be Kermit the Frog. It actually should be a pretty easy project consisting mainly of a green sweatshirt, green pants, and some crafty accessories. I've got 90% of what I need already so hopefully my mojo will come back just long enough for me to put it all together. 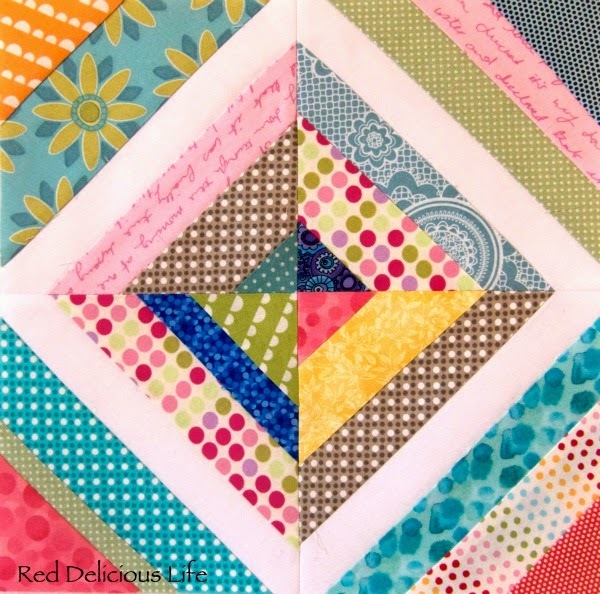 This block is 11.5" square and is made up of 4 smaller blocks, each 6 inches square. So for 2 finished 11.5"blocks you'll be making a total of 8 strip blocks. Fabric requests include the center strip to be white, whatever white you have access to is fine (white on white print is also okay if that is all you have). 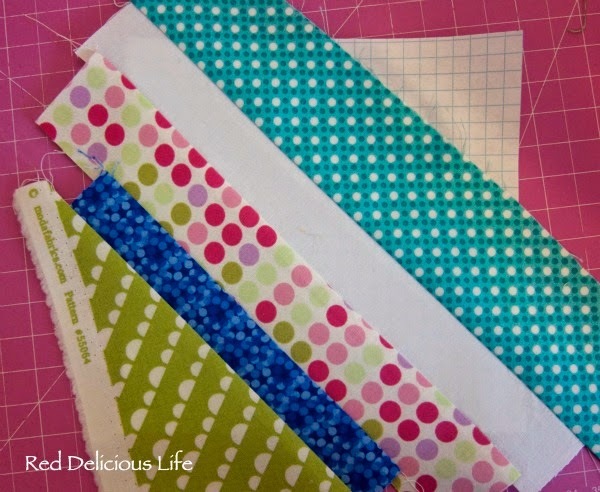 For the other strips, I love polka dots and geometric prints so those are always safe bets. As for colors, it's up to you but I noticed that I kept gravitating toward pinks, greens, and blues. Now that you know what you'll be making, let's focus on the how-to. Because I want the center to be a specific width, the easiest way I found to accomplish this is to use a foundation paper piece. You can either create your own or use the downloadable PDF. 1. If you're using the download, please be sure to print it at 100%, not scale to fit. I couldn't figure out how to add one of those scale squares so just measure the square to make sure it is 6"x6" and that the diagonal line is 1" away from the corners. 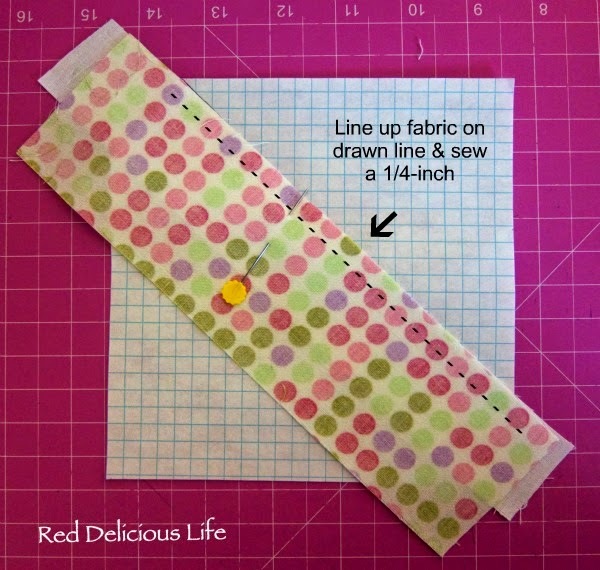 You will line the edges of your fabrics up with this line. It is not your actual sewing line. 2. 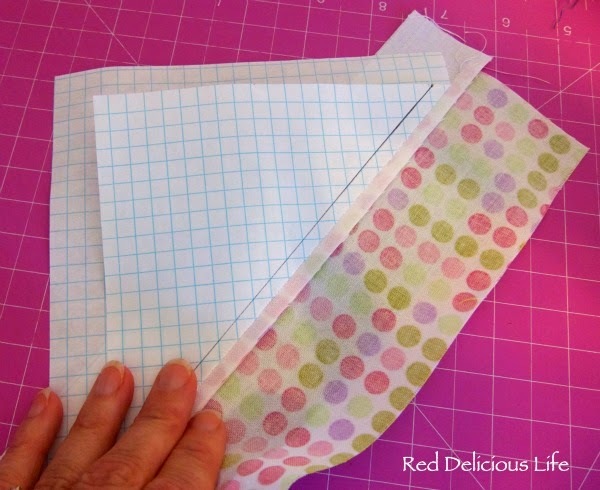 Now place your white strip down on the paper, lining it up with the line and covering the diagonal points. 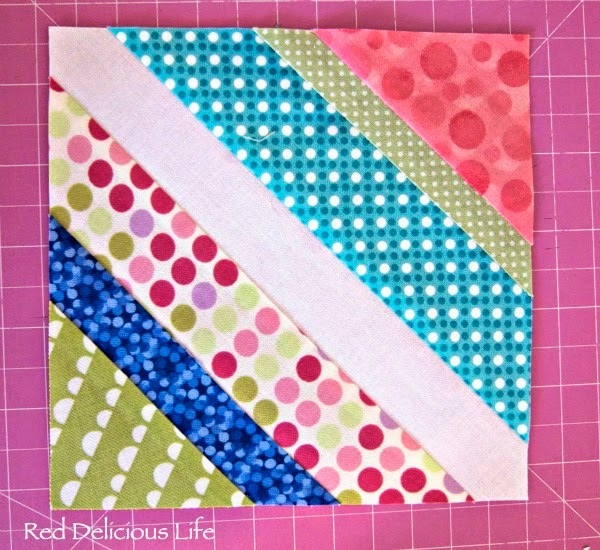 Place a colored strip on top of the white, with right sides together. Pin in place. 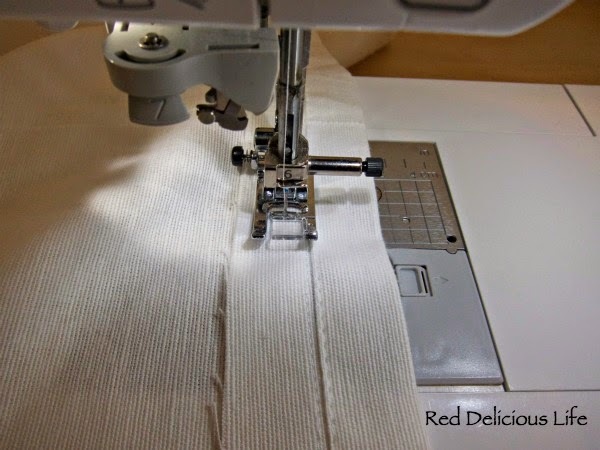 Adjust your stitch length on your machine so that it is smaller since you'll need to rip off the paper later. Mine was set to 1.4. 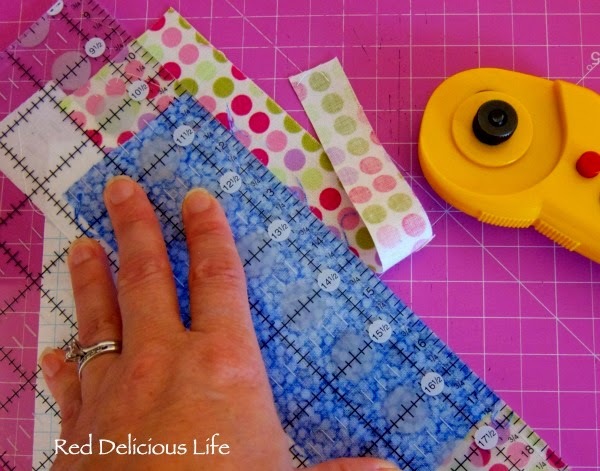 Sew a quarter-inch seam along the edge of the strips. 3. Press away from the center, toward the colored strip. 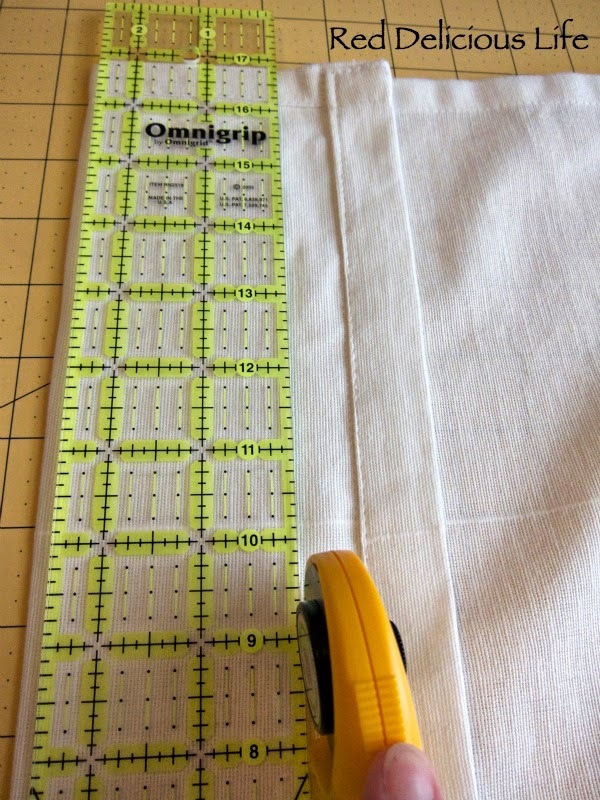 Keep adding fabric strips, remember to trim any excess from your quarter-inch seam allowance before pressing. 5. Once one side is completely covering the paper, you need to add colored strips to the other side of your white strip, using the same method from steps 2-4. 6. 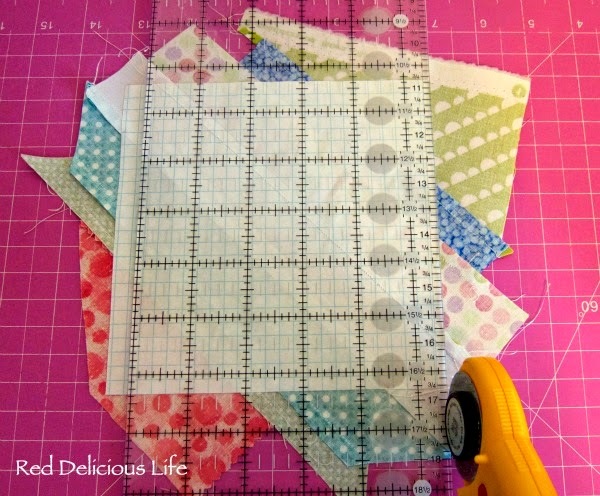 Once the paper square is completely covered, it's time to trim down your block. Flip it over so that the paper is on top. 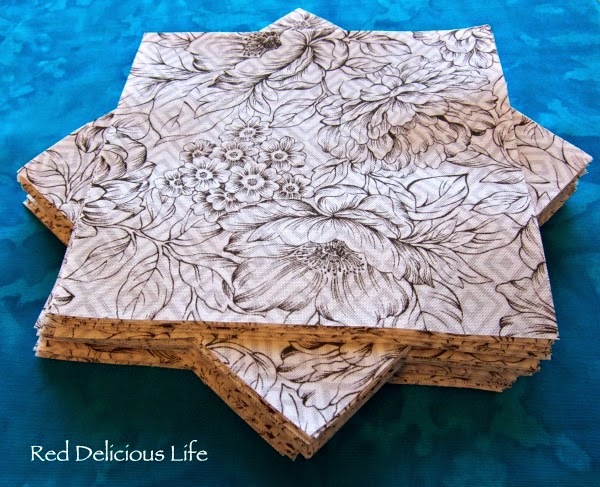 Using it as a guide, trim your block down to 6" x 6" square. 7. 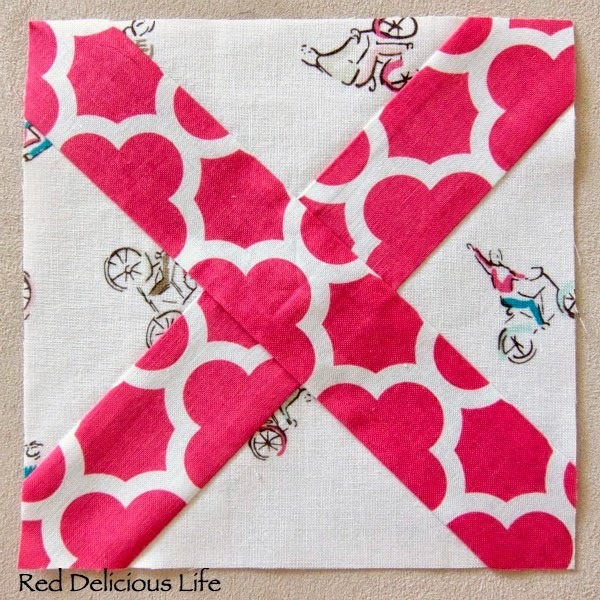 Tear away your paper, and voilà - a cute finished block! 8. Make 3 more blocks, using the steps above. Once you have 4 of the string blocks arrange them so that the white strips form a square and sew together. I found that pressing these seams open helped to reduce bulk. And that's it! Despite all of the pictures, and the lengthy instructions these really do come together quickly, especially if you have your strips already cut out and ready to go. 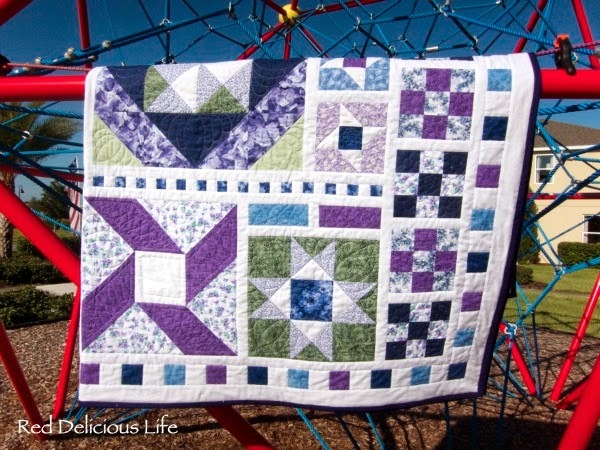 If this technique is new to you, a great video resource is Craftsy's 2012 Block of the Month class (it's free!). It's taught by Amy Gibson and she does a fantastic job of showing you this technique in lesson 5. Just note that for the first block in this lesson, she uses a fabric foundation piece, making it 2 layers, whereas I'm having you use paper that will be torn away. Have fun and if you have any questions let me know. I can't wait to see what you come up with! Here is my 2nd block. 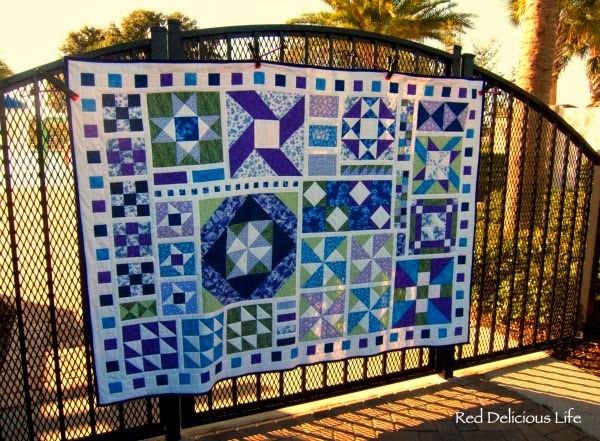 When I got bit with the quilting bug, it completely took over every ounce of my creative self. Before quilting, I knit. A LOT. Like, all the time, even in the car. No, not while I was driving but whenever my husband drove, I was usually knitting. 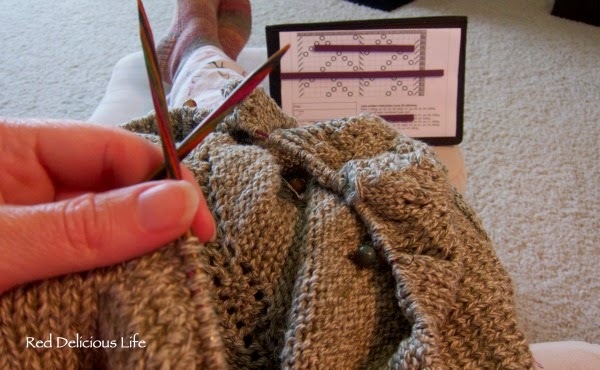 The last time I made a post about a knitting project was in July 2013. We moved to Florida that same month and I know I've not picked up my knitting needles since that time. That was 14 months ago! Having spent this weekend with a fever I didn't get much sewing done, opting for more sedentary activities like binge watching HGTV. I'm not sure why but today I dug out this sweater that I'd started 2 years ago. I'd stopped it in the middle of a row, one that has 252 stitches and a pattern chart. I'm lucky I could even figure out where I left off. It's hard to imagine knitting living in Florida, but I'm going to keep my knitting bag beside my rocking chair in the hopes that I'll finish this sweater. We're 5 weeks into the new school year and my son finally came down with a cold. What started out as a stomach bug has morphed into a head cold and now the entire family is feeling under the weather. 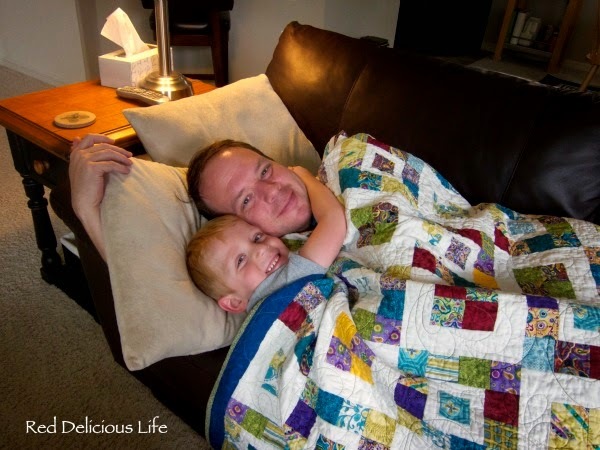 Given the overcast and rainy weather, it's the perfect Saturday to curl up on the couch, under a cozy quilt. Even the kitties are taking advantage of the lazy day. Here's Emma getting a good brushing. 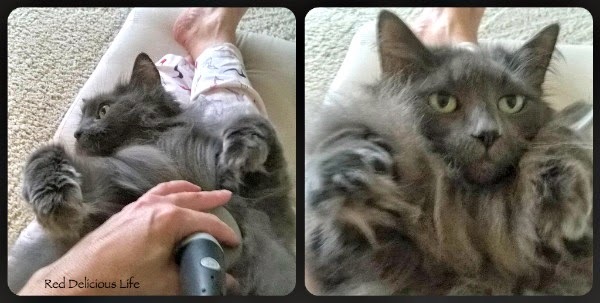 She's loves to be brushed, even on her belly. She's our senior kitty, at 12 years old. With all her humans lounging around, she wasn't going to pass up an opportunity like that! Not sure how much sewing I'll get done this weekend but that's okay. Quality family time, even with the sniffles, is always good. I've recently fallen in love with low volume background fabrics, even if I'm not a fan of the term "low volume." It seems confusing to me since they often have dark or black prints on them, but whatever. Call them what you will, I like subtle black and white prints that work well for backgrounds. 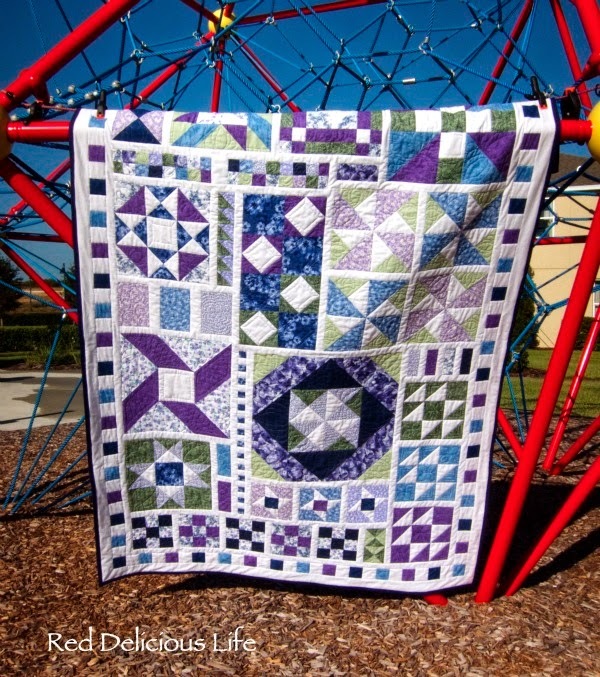 What really sealed the deal for me recently is this gorgeous quilt, Field Day, that Nicole from Modern Handcraft made. Isn't it just gorgeous! 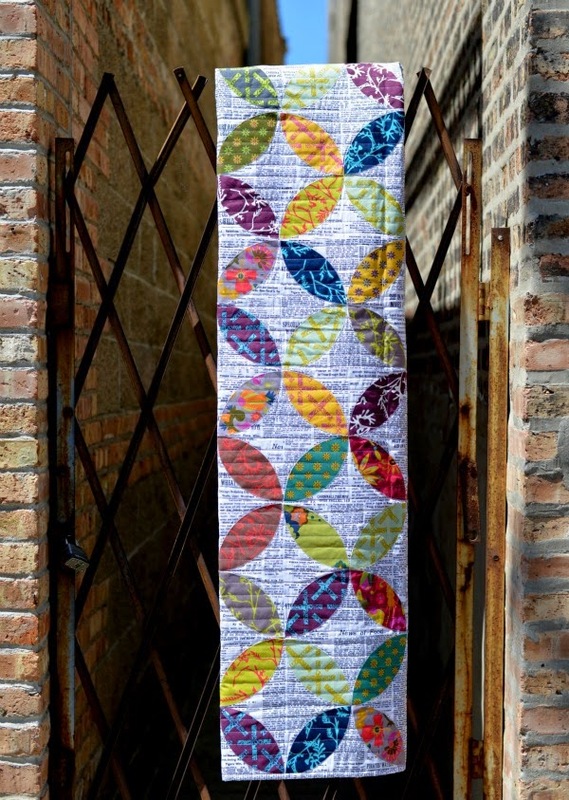 Not only do I now want to make a quilt with low volume prints, I'm even contemplating curves! Okay, that might be a stretch but I really do love the orange peel pattern that the petals make. 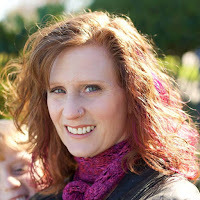 I definitely recommend that you check out Nicole's blog to find some really inspiring projects. 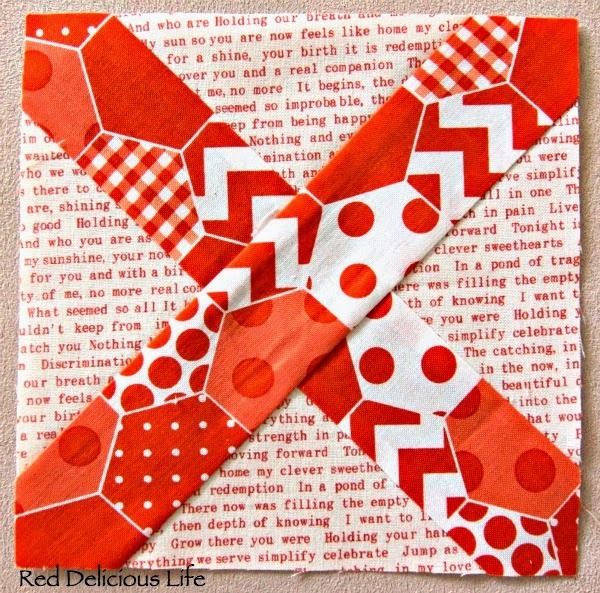 You may recall that my recent Holiday Hexies project was inspired from one of her tutorials. But back to the low volume fabric. I don't really have a ton in my stash, just a few fat quarters here and there. That's why I've joined the "Tone It Down" low volume charm swap that Chelsea from Patch the Giraffe is hosting. It was perfect timing. It also gave me a good excuse to visit my local quilt shop. After browsing for a while, I finally decided on a Color Principles fabric by Henry Glass called Tuxedo. I don't really get the name but I love the geometric design that you can see behind the black flowers. This little stack is 56 charms, from 1 yard of fabric. I purposely bought an extra quarter yard so I'd have some for myself. Can't wait to see all the great fabrics I get in return. Almost two weeks ago, I basted this top so that I could start quilting it. Guess what, it's still laying on our guest bed and hasn't been touched. I picked out a pretty thread color, Amethyst Frost by Isacord, but for some reason, I'm having trouble starting it. I'm just not sure how to quilt it. 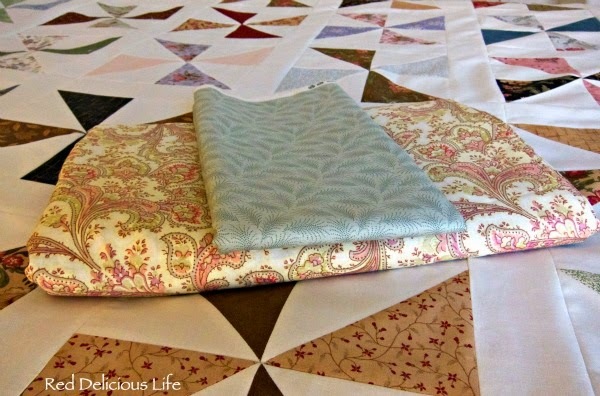 It's funny how most people choose to do a basic meander or allover pattern when the first start free motion quilting. Not me. I went all out and started custom quilting right out of the gate. After 2 years of quilt-making now I still have never done basic quilting. 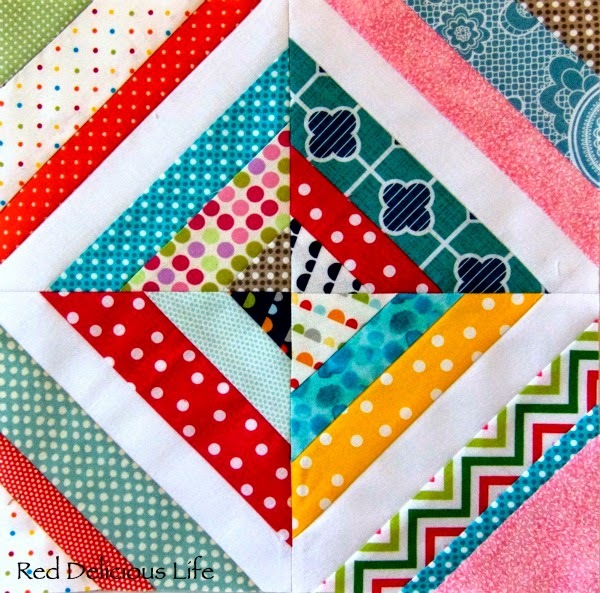 As much as I'd like to do an edge to edge pattern with this one, I think it just lends itself to custom quilting. I'm just a bit indecisive and have no game plan right now. Guess it's going to have to sit in the guest room a bit longer until I figure it out. Hope it's not too lonely in there. 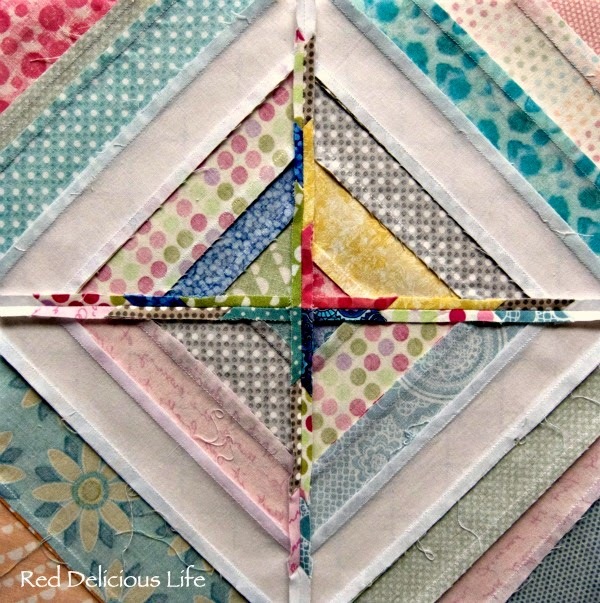 We are into month #2 for our compass quilters bee and our September queen bee is Nesta from Ella & Nesta's Little Room. For our blocks this month she wanted us to make these cute cross stitch blocks. They were really quick to make and the color combinations are endless. Here is the tutorial that she had us use, requesting that we make the 6 inch blocks with pinks, yellows, or oranges with low volume or white backgrounds. I know my block in the upper right looks small but I promise, it's the same size as all the others. It's just an optical illusion from the camera angle and the placement on the edge of the ottoman. I hope the bottom right one isn't too gold. It's definitely not as bright a yellow and the other two. Here are my 2 favorite blocks. Both of the crosses on these blocks are Riley Blake fabrics. What I really love about them though, are the background fabrics. I knew I'd be able to use this bicycle fabric someday, and the text fabric just matched perfectly. She originally requested 2 blocks from each member of the bee, but we all agreed that we should do 8 since they were so small. I hope she likes them! Now to get working on my block for October. I've been meaning to share this on my blog for a while now but kept forgetting to take photos. With moving into a brand new home, we have LOTS of windows that need curtains. Ikea is a great place to get some inexpensive ones but they're always really long. 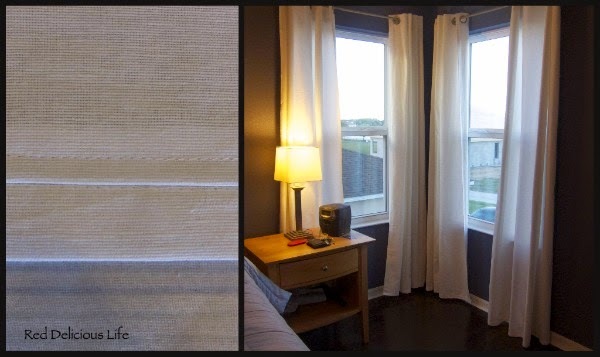 If you've ever needed to hem curtains then this tutorial is for you! Not only is it fast and easy, you get great looking results. How? By keeping the original hem. I wish my curtains weren't white for the purpose of my photos but this is what I had to work with. First, when the curtains are hanging up, take a safety pin and pin the bottom up to the length that you want. Just a few safety pins will do, just to get an idea of where it should be. Pin it with the right sides of the fabric together. Take the curtains down and head to your sewing machine. The trick to this method is in the math. Anyone who knows me, knows I'm mathematically challenged but if I can do it, anyone can do it! 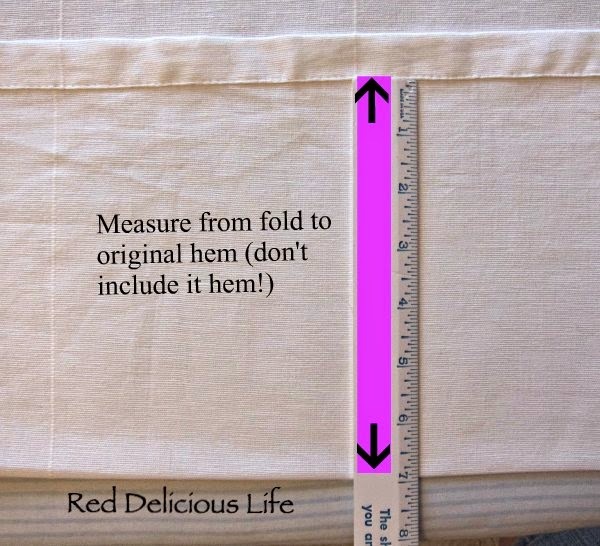 Laying the curtain flat on your ironing board measure from the fold to the hem (the curtain should still be pinned at this point). In my example below, it was 7 inches. We need to take this number and divide it by 2. In my example, that would be 3.5 inches. 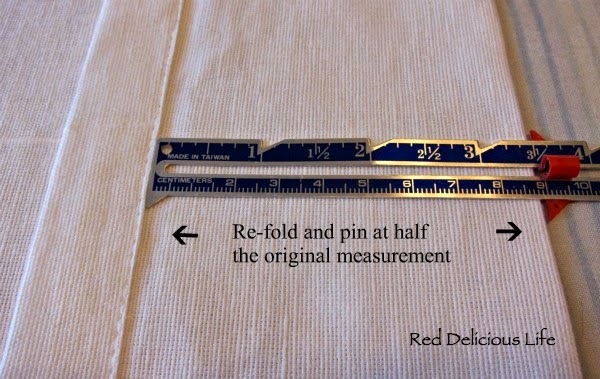 Remove your safety pins and fold up the bottom of the curtain to be your divided number, again not including the original hem in your measurement. Press and pin as you go along. Now it's time to sew right along the edge of the finished hem. I like to use my zipper foot - it presses against the original hem nicely. Once it's sewn, it's time to cut off the excess at the bottom. If you're not sure that you measured correctly now is the time to hang up your curtain and check. But trust me, it will be perfect. I like to cut off the excess leaving about a half inch seam allowance. I just eyeball it. If you want you can leave it like this, ironing it flat, but I prefer to sew down the seam allowance so there's no chance of the hem rolling up. It's never happened before, but I think it looks a bit neater. It's also helpful if the fabric tends to fray. 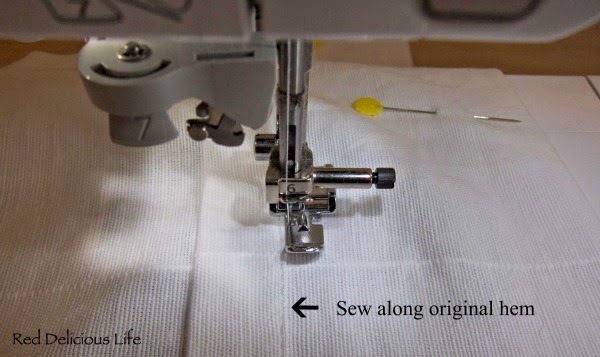 I just use my regular foot and just sew along the edge of the hem. That's all there is to it! Honestly, it took me about 30 minutes to hem 2 curtains. And did I mention it works great on jeans too? Yep! Closeup of the new hem on the left. Curtains hung on the right.